Using a sharp craft knife and steel safety ruler, cut out the centre section of each side between the outer supports and curb rail, taking care to leave the outer supports and curb rail intact. Replace the section removed with a same size piece of 1.00mm thick Plastikard with planks scribed to match the rest of the side. Add an etched brass rivet strip support down the centre of the new section, Mainly Trains MT163 or equivalent, fixed with Evo-Stik impact adhesive. Drill a 2.00mm dia. Hole just off centre in the floor and underneath a short piece of 2.00mm o/d Plastruct or similar tube, cut at a 45 degree angle where it is glued onto the floor. This represents the unloading valve which would have been positioned so as to avoid the brakegear and linkage when the grain was being discharged into a hopper between the rails at the flour mill. Complete the kit as per the general instructions, using the no door controllers (no doors!) 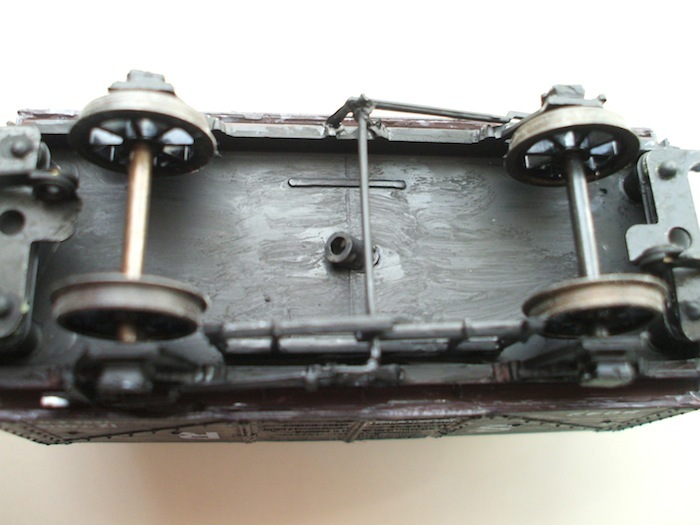 Lift-link brakes and with sheet rail options – it is definitely better to leave fitting the sheet rail until everything else, including painting and lettering, has been completed. The specific running numbers for the 20 wagons were 8042, 8048, 8059, 8087, 8120, 8227, 8295, 8315, 8549, 8620, 8660, 8822, 8875, 8926, 8999, 9004, 9039, 9199, 9224 & 9237. 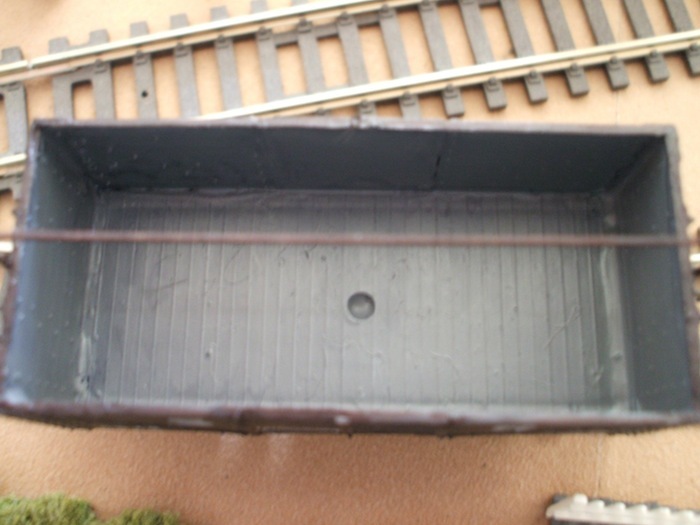 The non-common user symbol, the letter "N", was positioned at the bottom of each corner plate.If the wagon is going to be portrayed as running empty then no further work is needed, but if it is going to be portrayed as just loaded then a suitable load to represent the bulk grain is Javis "Countryside" Scenics, light brown, extra fine ballast chippings, ref. 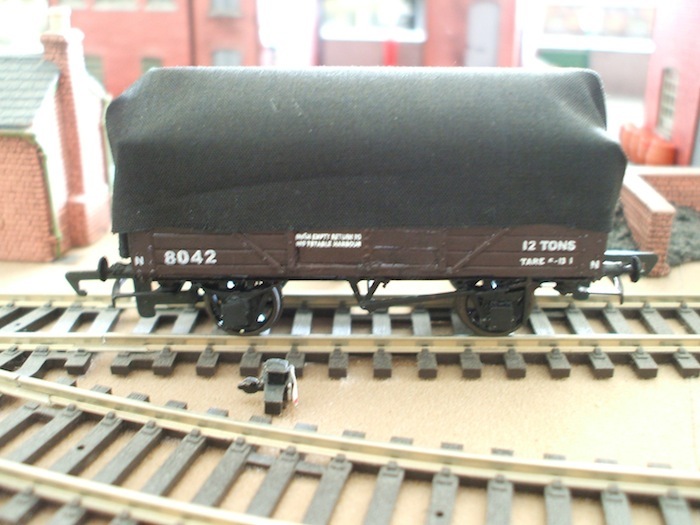 JGX112BR.If the wagon is going to be portrayed as running with its tarpaulin sheet then it would be a good idea to add ballast weight at this stage before fitting the sheet. 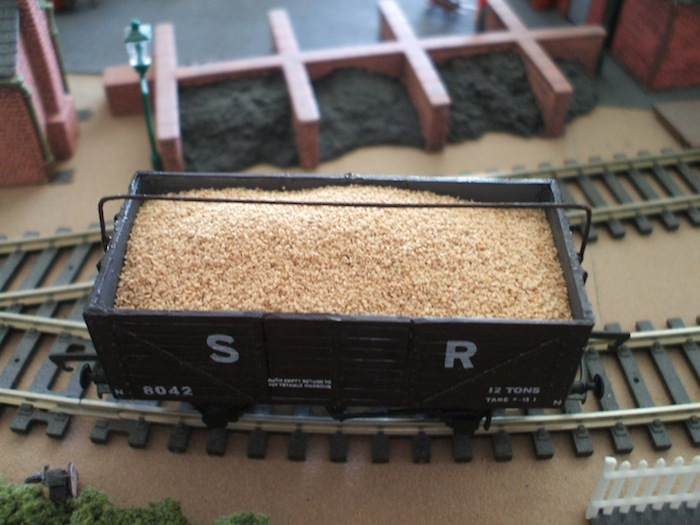 lt is highly likely that except for loading from above and when in the works for repairs and maintenance, the sheets would have been left in situ at all times in order to keep the interior of the wagon and the grain dry, grain can be easily spoilt by damp. To make the sheet cut out a rectangle of thin, black, lightweight, polycotton, Poplin fabric, size 120.00 x 62.00mm, with the edges prevented from fraying by an application of Prym Dritz Fray Check, which dries so as to be invisible and does not adversely affect the flexibility of the fabric. The S.R.sheets were normally lettered in white, but very little of the lettering is visible in the prototype photograph published. Modellers wishing to letter the sheet could use an appropriate white fabric marker such as a Sakura Gelly Roll medium point. Fix the sheet to the wagon sides first so that the initials Sand Rare just covered, and the empty to instructions still visible, using Flexi Grip repositionable/removable adhesive, which does not affect plastic or varnished surfaces and does not bleed into the fabric, or an appropriate equivalent, using small blobs of adhesive along the line of the cleat rings and also on the corner plates. Then fold down the centre part of each end of the sheet and glue below the sheet ring mechanism, and finally fold down/over the left and right hand sides of the sheet and glue them as well. The completed ends of the sheet should thus be just above the solebar. Flexi Grip adhesive is tacky enough to hold the sheet in position in normal running without it ever coming loose. 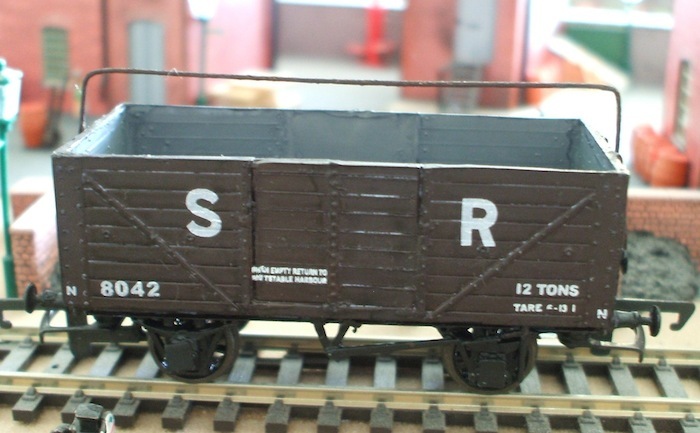 The converted wagons were eventually repainted in S.R. 1936 livery and later still in British Railways, Southern Region livery, but retained the empty to instructions without any change. B.R., however, added the word GRAIN on the left hand side above the other information, plus had dedicated sheets for the wagons, which included the words GRAIN TRAFFIC ONLY stencilled on them. Click "CLOSE, or outside the frame to return to the main page.